early childhood books. They recommend ‘Wild Animal Baby’, “Brown Bear, Brown Bear…”, “Fish Eyes”, “I Like Me”, “Rosie’s Walk,” “The Foot Book,” “Green Eggs and Ham”, and counting books. The books can not have religious, political, family or wealth mentioned in them. Lightweight paperbacks are best. Choose books that are age appropriate for preschoolers. Also pick books that aren’t very wordy because the books get translated. Places like the dollar store, discount stores, and Target’s dollar section are great places to find school supplies and small toys. Consignment/Thrift stores are great places to find inexpensive books, just make sure they are in good condition. eBay and Amazon also have books for great prices and you could get the item shipped directly to me. If you would rather donate money and have me do the shopping & shipping that would also be great. You can click here to donate via PayPal. 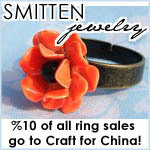 If you want to include items in the package you can email me at craftforchina@gmail.com. I will give an address to ship your things to. Then I’ll combine everything and ship it to China! When buying items try to find things that are on the smaller size and are lightweight. I don’t know how expensive it is to ship to China so lets make it as light as possible. I want to send stuff, but you should let me know what you have so far that way I don’t buy so much of something you have already purchased. I’ll email you so I can get your address.